Yesterday I lost a friend, a companion and a family member. 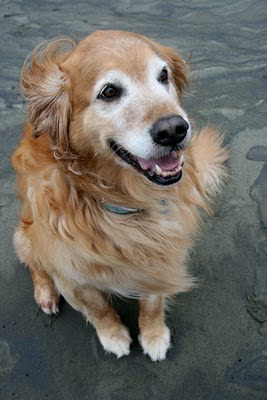 Our Golden Retriever, Tasha, passed away. She was almost 14 years old. I remember picking her out and bringing her home. She was so tiny, the runt of the litter, that she fit in my hand. I remember taking her outside our townhouse to do her duty and not needing a leash because she was so tiny I could walk faster than she could run. I remember how much she loved the snow, even in her old age. She would roll and burrow and jump. I remember her patience. She put up with so much and never ever attempted to bite or hurt anyone. I took her to preschool and the kids would love her and pull on her. She never even flinched. When Brandon was a toddler, he would grab hold of her hair to help himself stand up. She was patient. She was our canoe dog, going on several canoe trips. She would curl up in the bow of the canoe, leaving Katrina with little leg room. Or she would sit and rest her head on the bow....some of my favorite pictures. She loved the beach. She would run and roll and play in the waves. Water was one of her quirks. She loves to splash in the water, but never loved to swim. Sometimes when I would lie on the floor, she would come stand near me. I would rub her belly and she would just spin slowly in circles, sometimes stepping on me. Everyone who met her fell in love with her. She had a magnetic personality. One of my favorite memories of Tasha is when she would climb up on the couch and rest her head on my lap. Sometimes she would moan and groan until she got the attention - petting - she deserved. She loved us regardless of how much or how little attention she was getting. Unconditional love. I miss you Tasha and wish I could have hugged you one more time. I know you are no longer suffering and that makes me feel better. I wish to thank my sister and family for becoming her second, new family. They took her in when we couldn't bring her to Italy. They care for her, loved her and are now crying with us. They are her family too. Thanks for showing her your love. Katrina posted a beautiful memorial to Tasha on her blog. I've only watched it once so far because it makes me cry.